Chill out, you can still compost this winter! Photo by Alex Kristinsson. Don’t let Old Man Winter put the freeze on your composting efforts! He’ll try his best to thwart you by turning your piles to ice, slowing down microbes, shooing away composting crawlies, and stealing away the sun. Then there’s that whole issue of his powerful temptresses: hot cocoa, comfy couches, and fluffy quilts. Still, composters with a fire for recycling their food scraps can melt through any Polar Vortex, Arctic Assault or plain ol’ cold snap to make sure the job gets done. 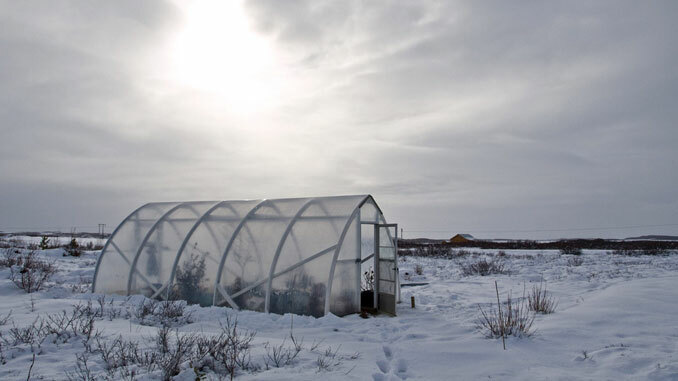 Here are a few tips and strategies for making winter composting a success! Keeping Red Wiggler earthworms indoors is an easy and fun way to turn food scraps into “black gold.” Worms are unobtrusive and hungry pets who, if maintained properly, live to do nothing more than munch compostables and poop out awesome organic matter that is a boon for soil and plants. Worms can be kept in discreet and small bins filled with a dampened “bedding” of carbon-rich items like shredded paper, cardboard, or coconut coir. Feed them controlled portions (1-2 cups per pound of worms) of fruit and veggie scraps, making sure to first freeze, then thaw and drain scraps to kill pest eggs and remove excess moisture. Don’t feed them until their previous portion is nearly gone, and avoid citrus peels, meat, dairy and cooked food waste. Click here for a great guide from the NYC Compost Project on making and caring for a worm bin. Bokashi is the process of fermenting organic material in an air-tight bucket in preparation for burial in the soil or in a compost pile. It’s an insanely easy process that has the added benefit of including all of your meat, dairy, bones and oily/cooked food waste — items normally considered no-nos for traditional compost piles. Deposit 1-2 inches of food scraps in your bucket, separating them with a dusting of bokashi bran. Cover bucket contents with a plastic bag and push down to squeeze out the air between your scraps. This will create a friendly, air-free environment for the anaerobic fermentation to occur. Once your bucket is full, let it ferment for a minimum of 2 weeks. Depending on much food waste you produce, it can take anywhere from a few days to a few months to fill up a five-gallon bucket. After fermentation is complete, bury your bokashi in soil to complete its transformation. This can be done in a trench, raised bed or outdoor compost system (more on all of this below). For more information on bokashi, check out this overview from Each One Teach One farms! If you have a sizable compost pile that generates heat, pack up your pile to help maintain its temperature. By covering your pile with a tarp or similar material, you’re helping to lock in heat and moisture. Both of these things speed along compost activity and are in short supply during colder months. This may keep your pile pliable and active enough to keep working through the winter. A lot of folks have a hard time trenching in the winter because the ground freezes solid. However, if you dig your trenches while the ground is still soft, you will have a ready-made receptacle for your scraps all winter long. Collect your scraps in batches, bury them along your pre-prepared trench as needed. By the time spring rolls around, there will be plenty of organic matter in the soil to serve as a delicious buffet for warmer-weather microbes and critters. Often called “lasagna gardening” or “lasagna composting,” this method alternates layers of browns, greens and soil ecosystem in a flexible recipe that passively cooks up into delicious compost. It’s a great way for gardeners to make or reinvigorate soil in a raised bed, ensuring that spring and summer plants have plenty to munch on as they grow. Layering your compostables is winter-friendly because there is no digging or turning involved. Plus, your scraps can be saved at room temperature or thawed if stored in your freezer so they are pliable and easy to manage. An empty raised bed. Think outside the box in terms of what your space can accommodate. Small-space containers used in container gardening such as window boxes, buckets and pots are all candidates for this method. Start with a layer of browns which, in time, will absorb some of the liquids that may leach out of your greens. Alternate layers of greens and browns, making sure to sprinkle some soil/compost throughout. Once you’ve put in all the compostables you saved, cover them with several inches of soil. Repeat this process as you collect batches of compostables throughout the winter months until your bed is full. Not so bad, no? If you have additional tips or strategies for composting during colder months, please add them to the comments below!